Follow a soldier who fought on Patton's Third Army and who landed on Omaha Beach at 9.a.m. on D-Day; a female Army Air Forces nurse who made helping veterans her life's work; a fighter pilot who flew with the African-American unit known as the Tuskegee Airmen and who was on one of the two teams that won the first Top Gun meet after the war; a guard in a top-secret intelligence base outside of Washington, D.C. where top german weapons scientists were interrogated; a female aircraft mechanic who served int he Navy and is still active in veterans affairs seventy years later; a gunner on a B-17 heavy bomber who was shot down and spent fourteen months in German prison camps; an airman in General Curtis LeMay's 20th Air Force, the unit that dropped the atomic bombs, and more. The author is a graduate of the University of Michigan, Ann Arbor, B.A. (English Literature and Philosophy) and M.A. (Philosophy) and Harvard Law School, J.D. Her mother served in World War II in the U.S. Army, her father served in the war in the U.S. Navy, her maternal uncle served in the war in the British Marines Commandos and fought in Normandy on D-Day, and another maternal uncle was killed in a training accident in Texas while serving in the U.S. Army. Her grandfather was wounded fighting for Britain in World War I. 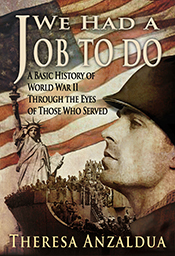 Such a fantastic peek into World War II through those who lived it. A great gift and my next book club pick.